model 1 (non-TMSS) w/model 1 sega-CD, modded for region & overclock switches! looks great over RGB, currently have the 32X unhooked since i tend to play more SMS games, but hoping to get an actual master system sometime so i can leave it plugged in. Mine are Megadrives and a young upstart, they're the ones I had as a younger fellow, haven't got them out of the box to test since I brought them from the UK to Australia. 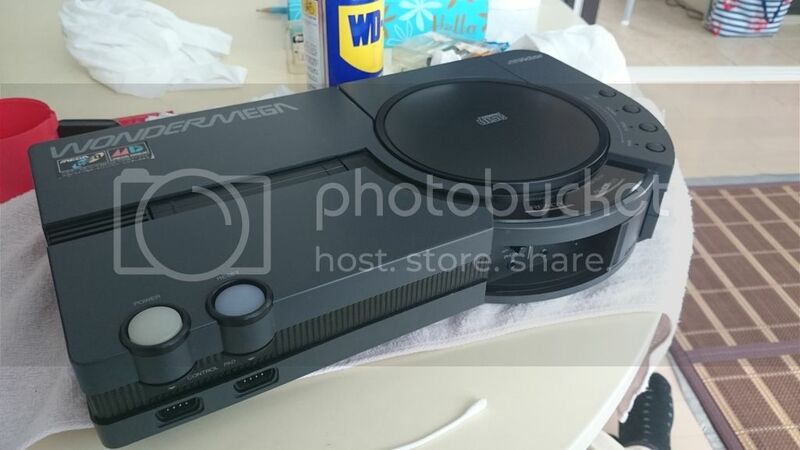 Model 1 "High definition graphics" variant with a 3 button controller and Vectorman 2 in the cartridge slot. My lil' powerhouse (CDX plus 32X add on). Been on a "Valis" kick lately. Nomad with screen upgrade. Nomad video out runs into 32x. 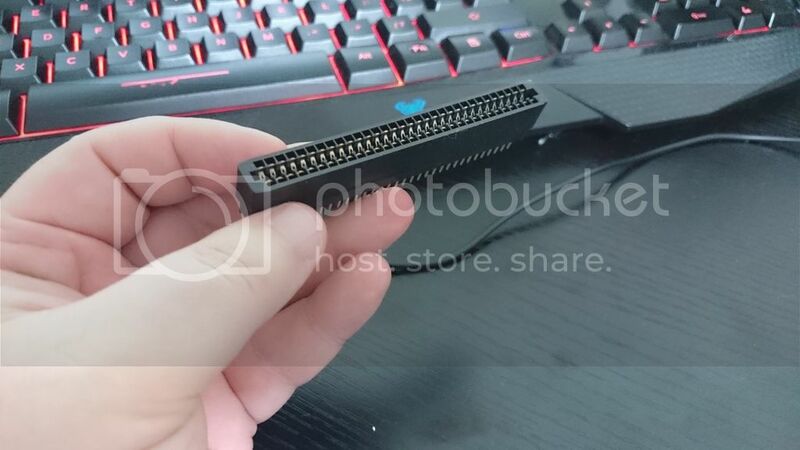 32x video out runs into replacement screen. The Nomad is powered by its battery pack and the 32x is powered by the Game Gear battery thats clipped to my hip. And of course the extra 6 button controller for some sweet on the go Cosmic Carnage battles. The best part is its not that noticeable on your Nomad! Can you imagine I you had this as a kid. Even better you got it when you're 40. Im not going to lie this picture is a fake... It is theoretically possible, and I was considering taking on the challenge of making this. I cant bring myself to make such a permanent mod to my Nomad for something so silly. Maybe someday I'll get a spare Nomad and a spare 32x and create this monstrosity. Edited by Dripfree, Mon Jul 4, 2016 8:02 PM. I don't know what the board revision on it is, all I know is that I bought the Genesis for $30 a few years back and have a fairly small (16-cart) collection, but it's been a pretty sweet machine. 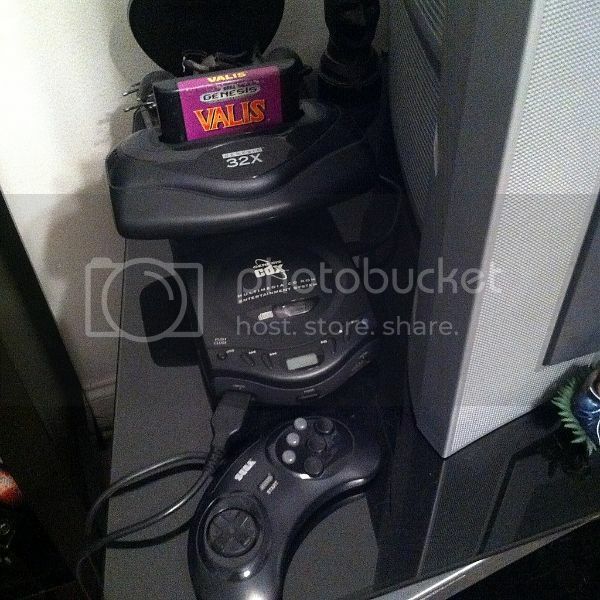 I just got the 32X this year, and I'm hoping to find a Sega CD sometime here to play around with. 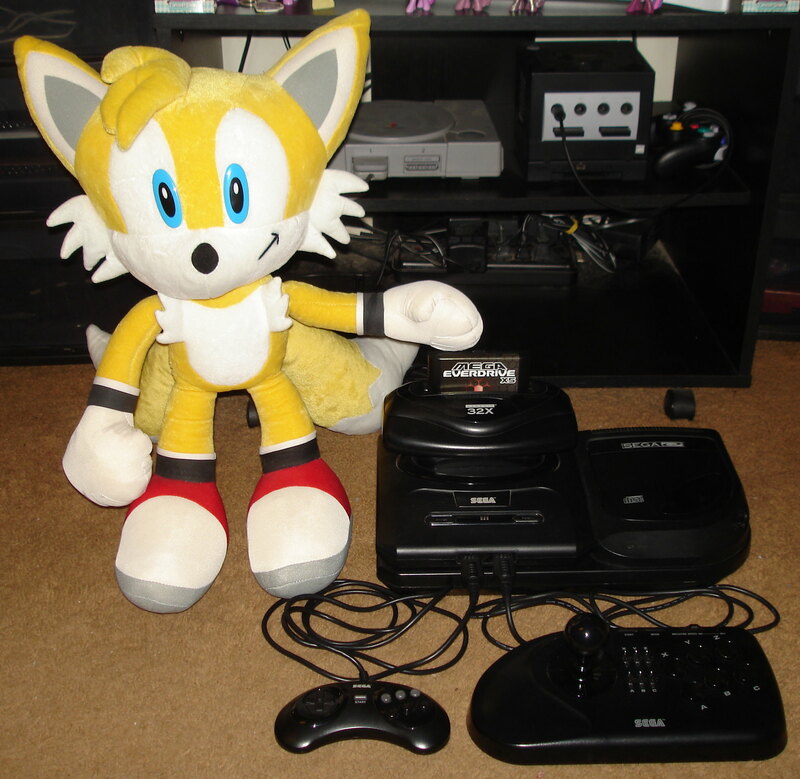 I'm lucky enough to own many Mega Drive units. Here are my favourite ones. I also have a silver Mega Drive which can be see on the opening credit of my Retro Core show. Nice looking units Yakumo. Really stands out in your collection. Thank you for sharing this with us! Thanks. I've got about 6 Mega Drive 1 consoles at the moment. I never actually wanted them but they came with bulk game buys. I guess I can use them for mod projects. Actually, here's two sitting on the floor right now. One needs it's audio caps fixed as there is a terrible buzzing from the audio and the other needs the cartridge port replacing. I already have a replacement ready for that fix. My goodness! 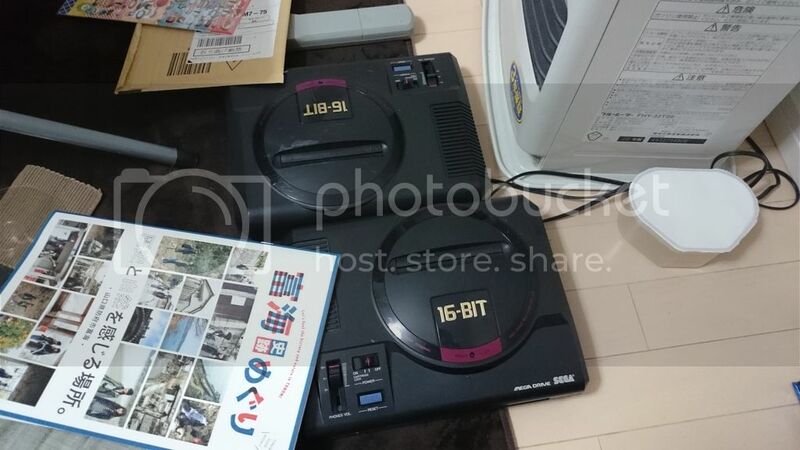 6 Mega Drive units? Truly amazing! I didn't realize how dedicated you are with the Mega Drive. I certainly need to see your works on your channel and learn from a master like yourself! Thank you as always Yakumo for joining Atariage. Keep up the great work! Edited by fdurso224, Tue Jul 12, 2016 5:15 AM. 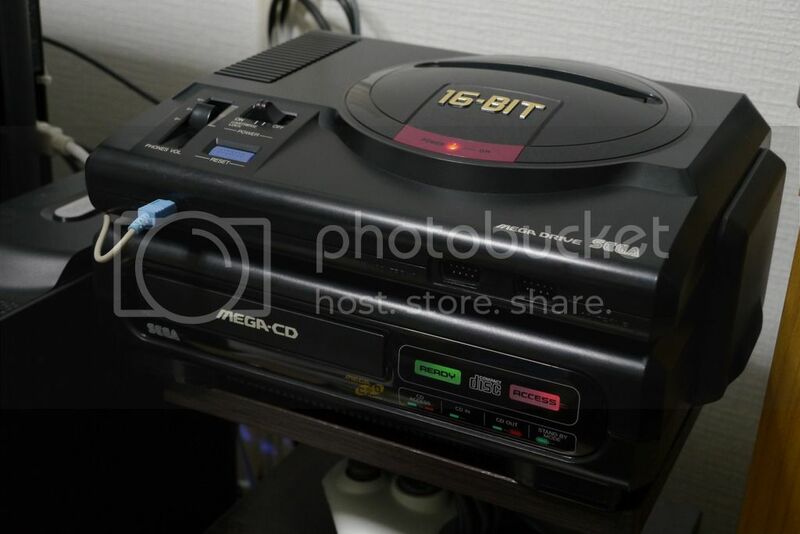 Agreed, the Mega CD looks so much nicer than the Sega CD. That looks so dull as the colours have gone along with the access intercator diagrams. 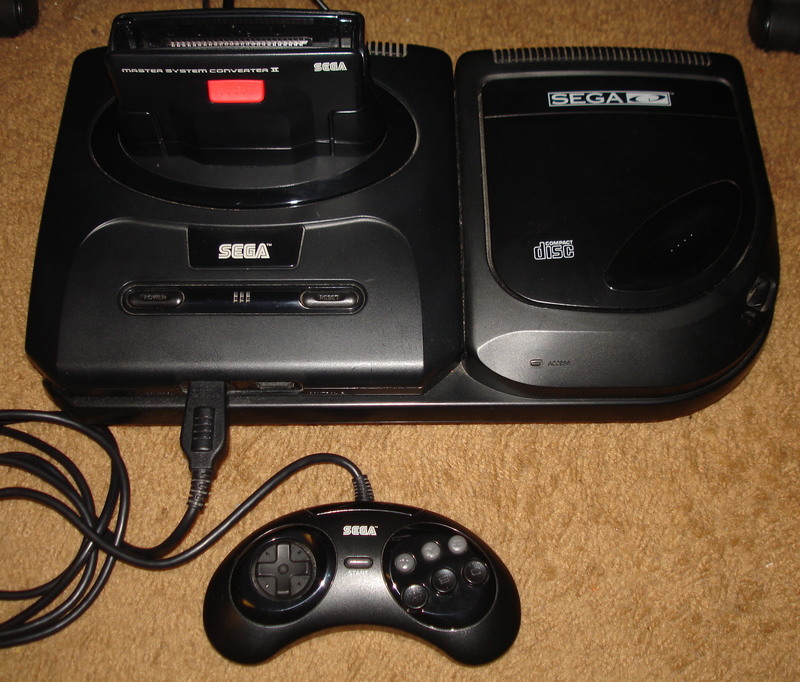 Also, Im not a fan of the Sega CD logo. It's quite ugly and too big. Here's mine! Got it from the exchange like four months ago, then I've replaced the red led to a super bright blue one! The cart you see is empty cause I've put Sonic 1's PCB in a clear gens shell and made a cheap label for it and used this as a dust cover. Edited by Prince Manic, Mon Jul 18, 2016 11:46 PM. Man, that's one bright LED. Was thinking of changing the LED in my silver Mega Drive to purple but I can't find a suitable LED for it. It was Mouser Electronics' idea XD not sure if they can ship it all the way to japan, it worth speaking to them and see if they can I'm sure they may have a purple one. I can try google search and put in purple 3mm Super Bright Purple LEDs and see what I get. Thanks for the heads up on the purple Led. I think it will be better to source one I Japan though as shipping 1 LED from the states will probably cost more than its worth. I use a UV LED in my Genesis model 1. However, the only place I've ever seen them was when I had RadioShack here locally. I don't believe they offer the UV LED online and I've not really seen them since. I've got one spare one left I believe and it isn't for sale. At least, not until i can find another place to get them. I'm surprised no one has posted a picture of their SNES as a joke... though maybe I shouldn't be surprised, because no one likes getting beat up on a video game forum. Edited by zylon, Fri Mar 2, 2018 5:58 PM. It's like a RetroN 1995! On a side note, since I never mentioned it when I first posted a picture of my setup, the Genesis itself is a 3/4 motherboard VA3 model. I did have the opportunity to get a VA4 but decided to go with the VA3 since a lot of the VA4s have compatibility issues with Knuckles Chaotix for the 32X, and I loves me some Vector the Crocodile. As far as I can tell this VA3 sounds every bit as good as any Model 1 Genesis I've ever owned and the composite video output looks surprisingly clean, so all in all I'm really happy with my Sega setup. Edited by Jin, Sat Jun 9, 2018 4:00 PM. Can't believe I've never posted in this thread. I just have the one Genesis but I wanted to kind of show off my retro corner in my office, too. Visible in this photo are my VA4 Genesis model 2, SNES Classic Mini, PC Engine Core Grafx, Dreamcast, PS2, and Japanese model 2 Saturn. Under the Saturn but not displayed is an OG Xbox, as well. The monitor looks kind of gross but that's because I used a 5-second exposure time on my camera in order to compensate for low light. The only editing was resizing and color balance. I think it turned out pretty good, all things considering. The monitor is a ViewSonic 27" IPS 1080p display with HDMI and VGA inputs. There's also a Monoprice HDMI switch in the back, but it's auto so I don't need to get at it. Edited by derFunkenstein, Sat Jun 9, 2018 6:15 PM. the most import part of that 2nd photo is the lovely blue glow to the upper left of the core grafx. Think it would be worth a mention in the list of gear. Edited by keepdreamin, Sat Jun 9, 2018 6:22 PM. Yes, of course! Not sure if you'd remember, but it was purchased on your recommendation, btw. None of this would have been possible without an Open Source Scan Converter, which as keepdreamin indicated is the shining beacon next to the PC Engine.